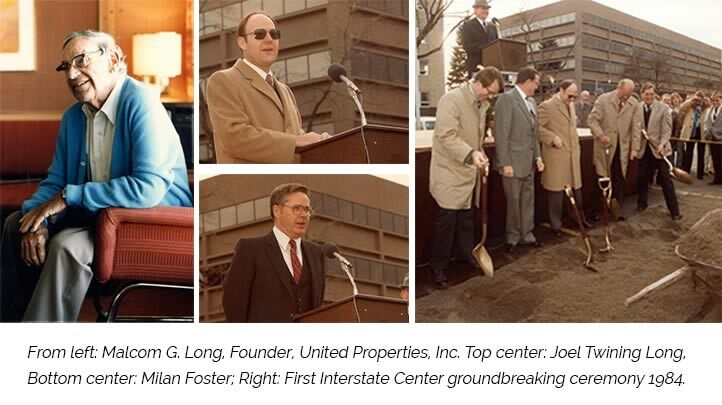 About Us | United Properties, Inc.
United Properties, Inc. is a family-owned development, holding and management company in business for over 60 years. Located in the heart of downtown, we take pride in offering the premier, Class A real estate in Billings. Our ties to Billings are historic, and we have a rich legacy of investing in the community. An engineer, entrepreneur and innovator, Malcolm’s businesses expanded over four decades across Montana and northern Wyoming. Malcolm and Thelma Long, along with their three children and their spouses, have a legacy of being active supporters of education, culture and the arts in Billings and Montana. The family has given major gifts to the Montana State University system, the Alberta Bair Theater, Billings Symphony, the Billings YMCA and St. Vincent Healthcare.